Tachometer, also commonly known as revolution-counter or tach, rev-counter or RPM gauge, is an instrument which is used in automobiles and other applications for measuring the rotation speed of a shaft or disk, as in a motor or other machine. Globally, increasing demand for tachometers into automobile industry as a result of increasing vehicle sales and consumption is expected to be the prime growth driver for tachometers during the period of study. 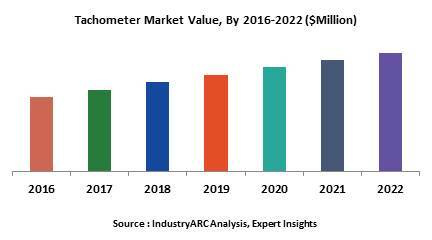 Geographically, Asia-Pacific dominated the tachometer market driven by higher demand and consumption of tachometers into various applications in major end-use industries. Asia-Pacific was followed by North America and Europe as second and third largest market for tachometer market. Asia Pacific is projected to have the fastest growth, owing to rapidly expanding automobile industry and expanding manufacturing base of major end-use industries in developing nations such as China and India in this region. This report identifies the tachometer market size for the years 2014-2016, and forecast of the same till the year 2022. It also highlights the market drivers, restraints, growth indicators, challenges, and other key aspects with respect to the tachometer market. Tachometer market research report is classified on the basis of type. Some of the major types covered in this report are as follows: Digital and Analog. Tachometer market research report is classified on the basis of data acquisition technique. Some of the major data acquisition technique covered in this report are as follows: Contact Type, Non Contact Type. Tachometer market research report is classified on the basis of measurement technique. Some of the major measurement techniques covered in this report are as follows: Time measurement, Frequency measurement. Tachometer market research report is classified on the basis of application. Some of the major applications covered in this report are as follows: Automobiles, Aircrafts, Medical, and Others.